MyPetLamp - Duckling (MEGDUCK) at Pure Design / Bedroom / Lighting ::: Furniture for the Home, Office, Home Office, and More at Pure Design Online! 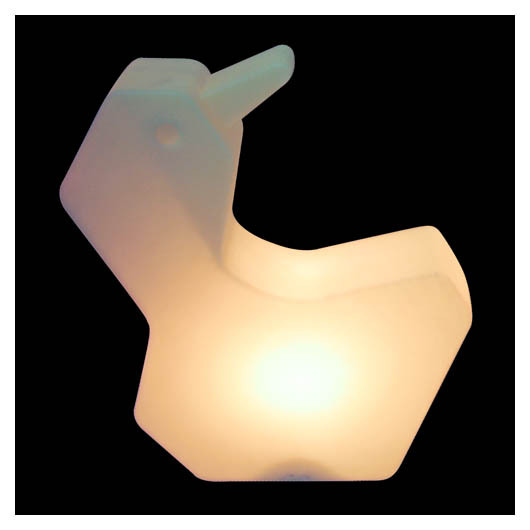 The MyPetLamp-Duckling from Offi has a modern cubist's take on this favorite waterfowl. It is made of non-toxic, odorless plastic with a low voltage (12v) replaceable bulb that bathes a room in soft light. Available in two colors: Warm Milk and mellow Yellow. See also: light bulb installation instructions. This item cannot be shipped to Canada, AK or HI.